When an entrepreneur starts a company, he or she often has a very clear vision of what he wants to accomplish with the organization – what I call the “organizational vision.” He also knows what the space will look like – envision the hardscrabble beginnings in a gritty Silicon Valley garage or basement. He is intimately involved in hiring the first employees, and therefore has a short-term HR strategy figured out – even if that strategy is hiring friends with whom he knows he can work well. 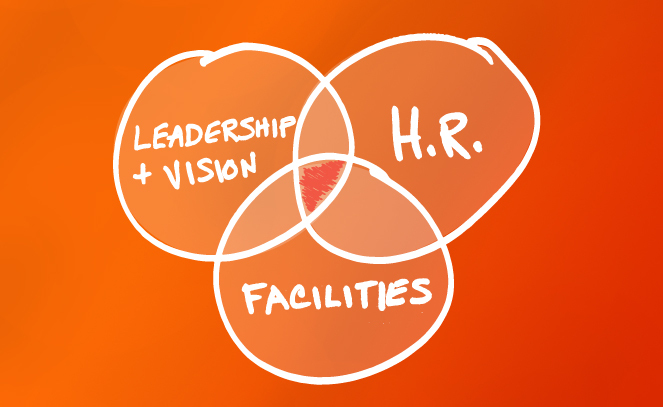 Leadership, Facilities and HR are often the work of a single person. (Figure 1.) As the company grows and more people are hired, the tasks of space planning (facilities) and people (HR) get further and further away from the leader, and from their core vision that drove the early days. (Figure 2.) When this drifting happens, one will see facility departments making decisions independent from the work of HR – and HR making decisions independent of facilities. This time period often marks the beginning of the “WTF” rumblings from employees. For example, how often have you heard, “WTF – they just hired three more people and we have NO place to put them!” Or, “WTF, they are reconfiguring our space again to squeeze in more people!” Beyond these rumblings, you will encounter both facilities and HR making decisions that are not directly linked to the CEO’s vision. This happens because the CEO either assumes everyone knows what his vision is, or is so busy leading the strategic direction of the organization that he does not have time or the wherewithal to realign and refocus with his staff. 70% of employees in the U.S. are not engaged at work; and of those, Millennials are the least engaged. Office change is scary – it is one of the top stressors for people, near the top of the scale with divorce and death of a loved one. Yet, bringing employees through change unscathed can be done well, and can be used as a tool to improve employee engagement. Creating environments that attract and retain top talent – including the burgeoning millennial generation – is what Workplace Transformation Facilitation is all about. Yes, we are WTF – but we are the good kind! If you would like to learn more about Vision Clarification ™, please contact Lisa Whited at lisa@workplacetf.com or 207 329 2189. WTF, you have nothing to lose – and you have happier employees to gain!